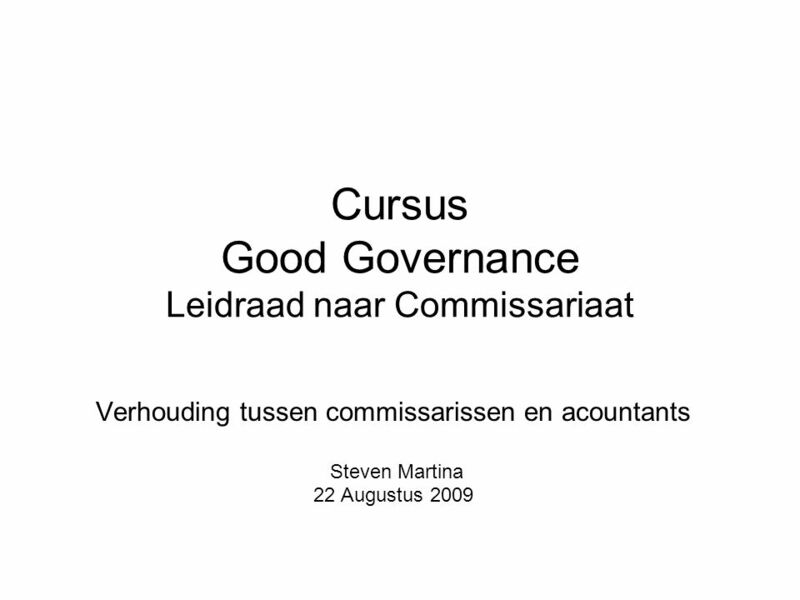 Cursus Good Governance Leidraad naar Commissariaat Verhouding tussen commissarissen en acountants Steven Martina 22 Augustus 2009. 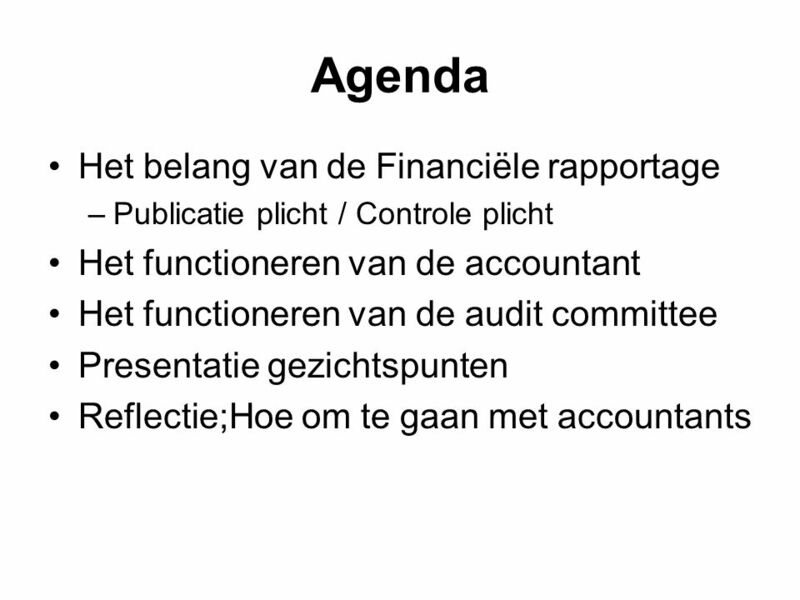 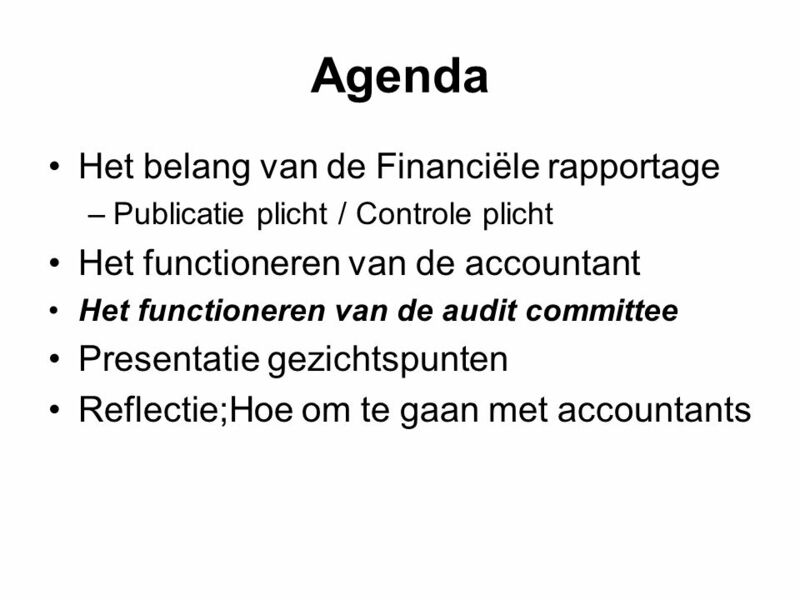 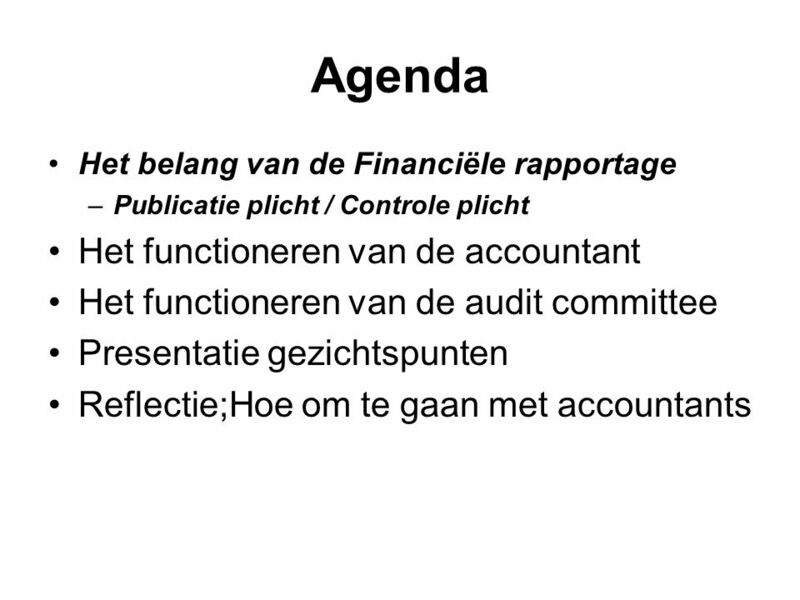 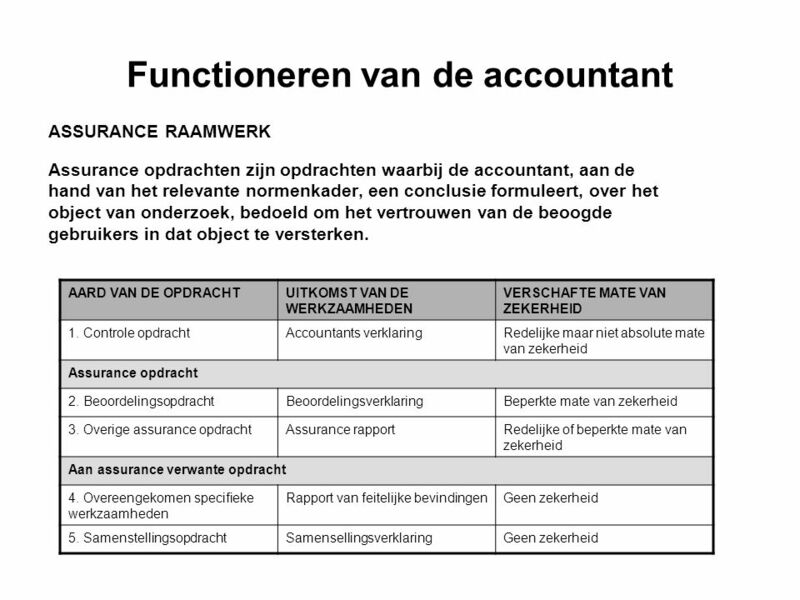 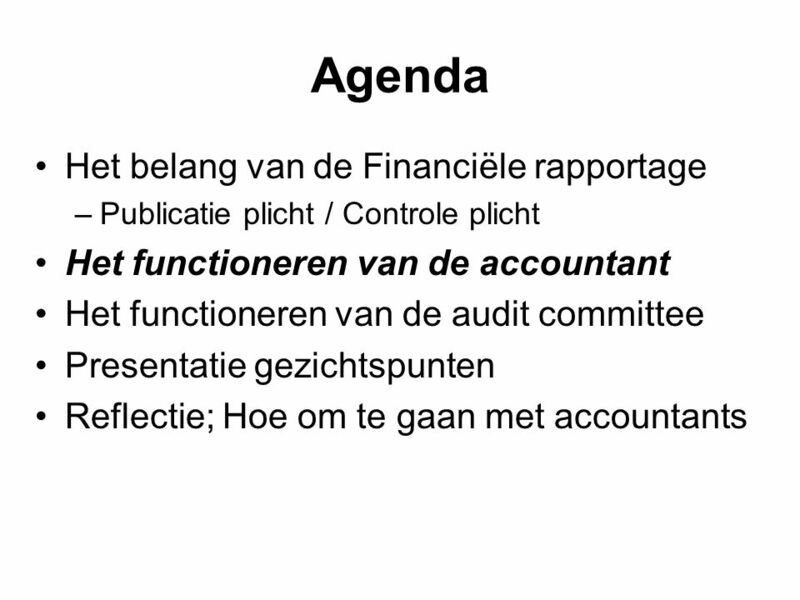 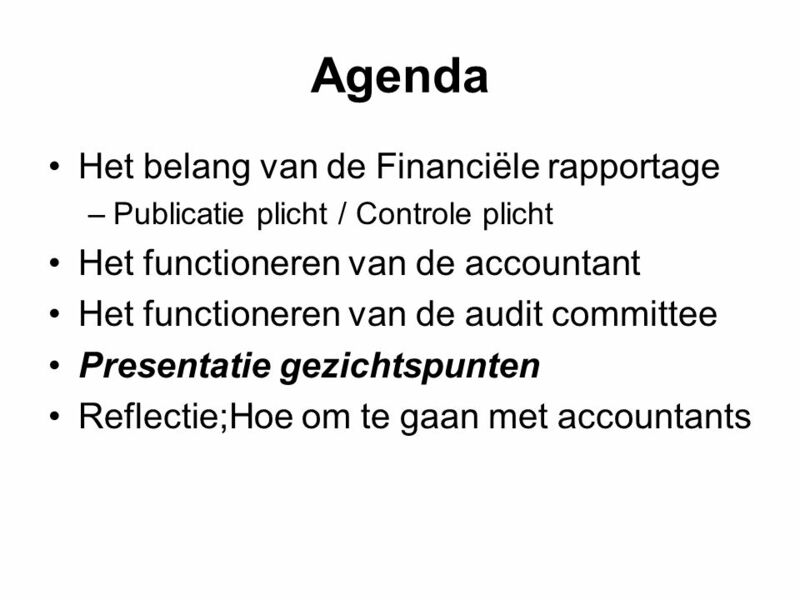 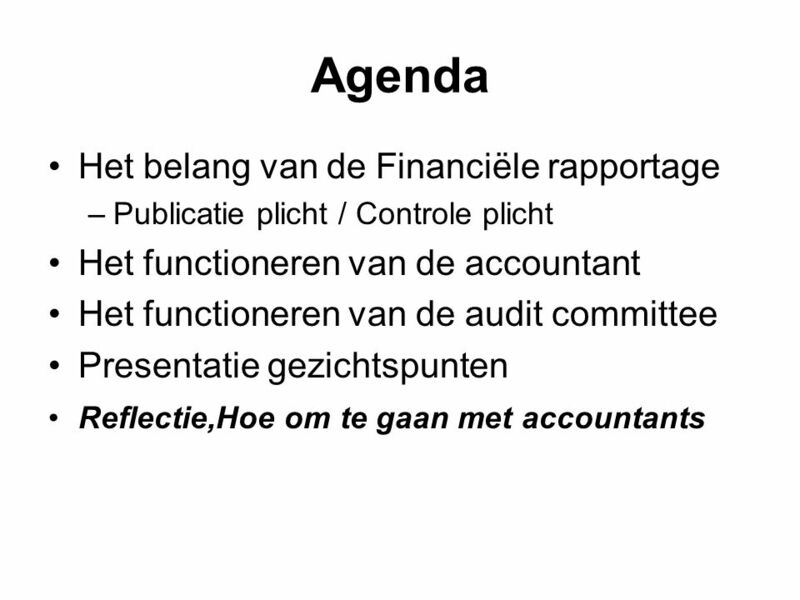 5 Het belang van de Financiële Rapportage The fundamental objective of financial reporting is to provide useful information to investors, creditors, and others in making rational decisions. 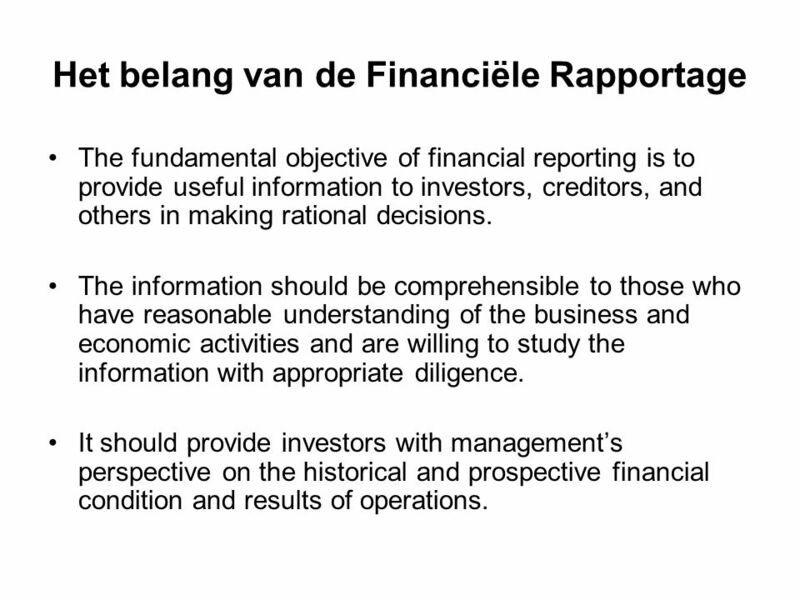 The information should be comprehensible to those who have reasonable understanding of the business and economic activities and are willing to study the information with appropriate diligence. 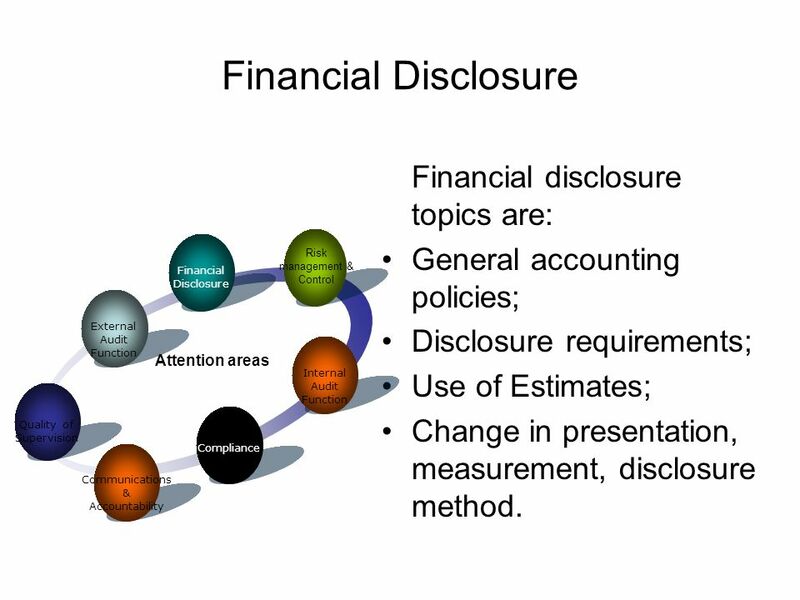 It should provide investors with management’s perspective on the historical and prospective financial condition and results of operations. 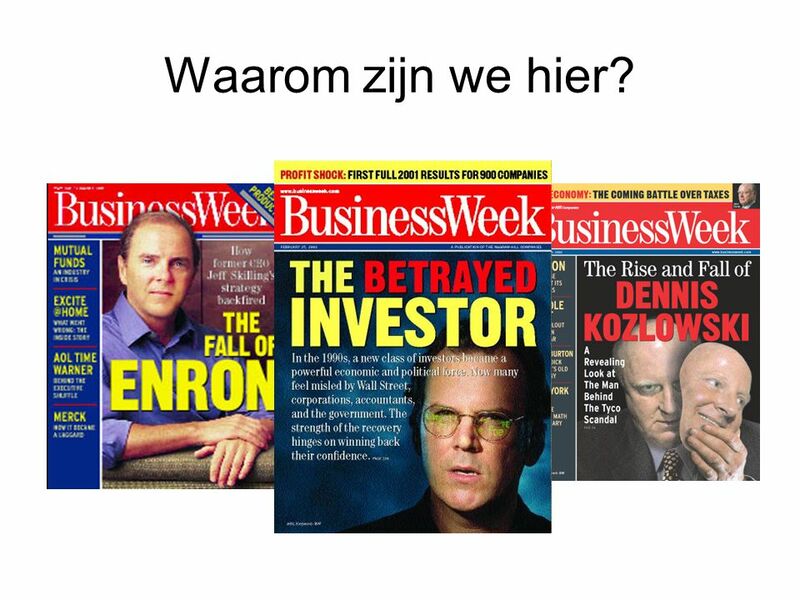 8 Waarom zijn we hier? 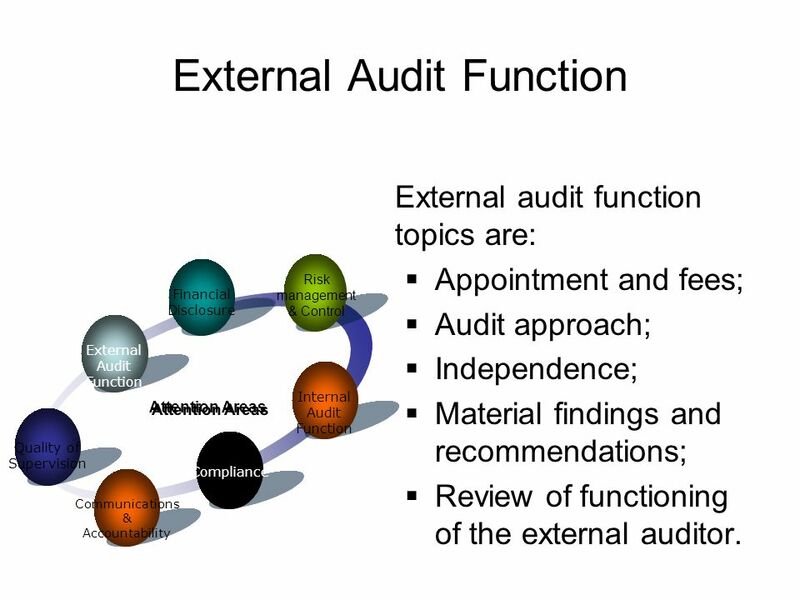 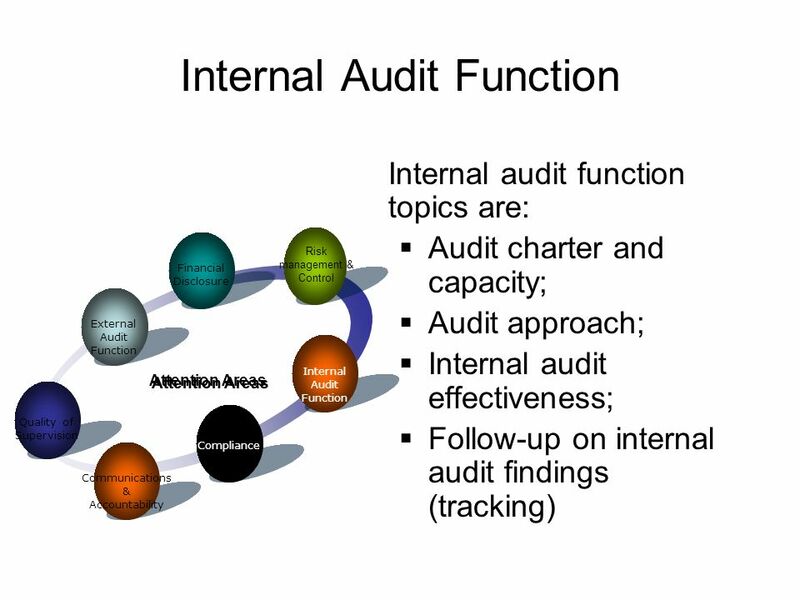 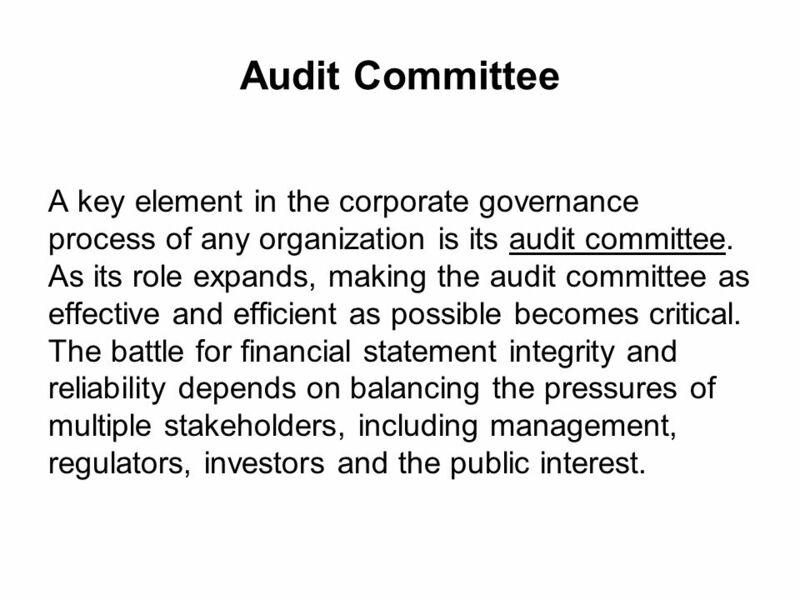 20 Audit Committee A key element in the corporate governance process of any organization is its audit committee. 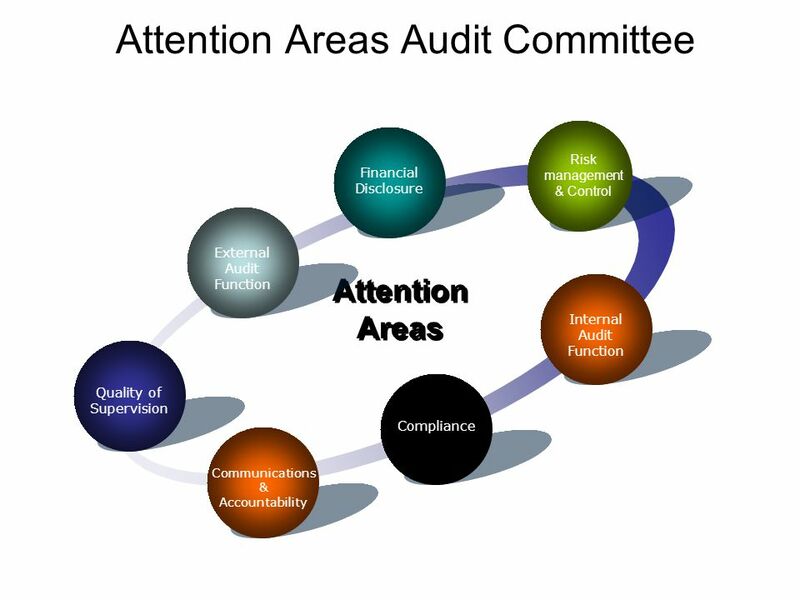 As its role expands, making the audit committee as effective and efficient as possible becomes critical. 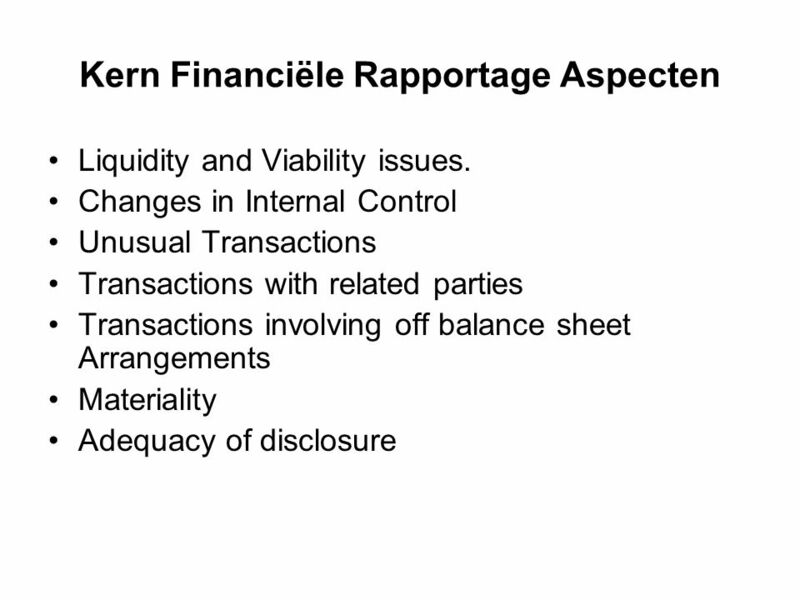 The battle for financial statement integrity and reliability depends on balancing the pressures of multiple stakeholders, including management, regulators, investors and the public interest. 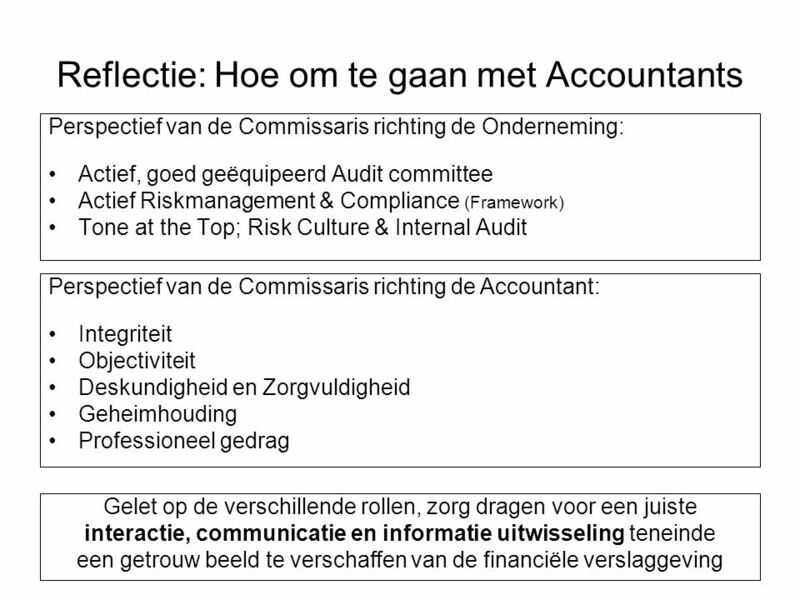 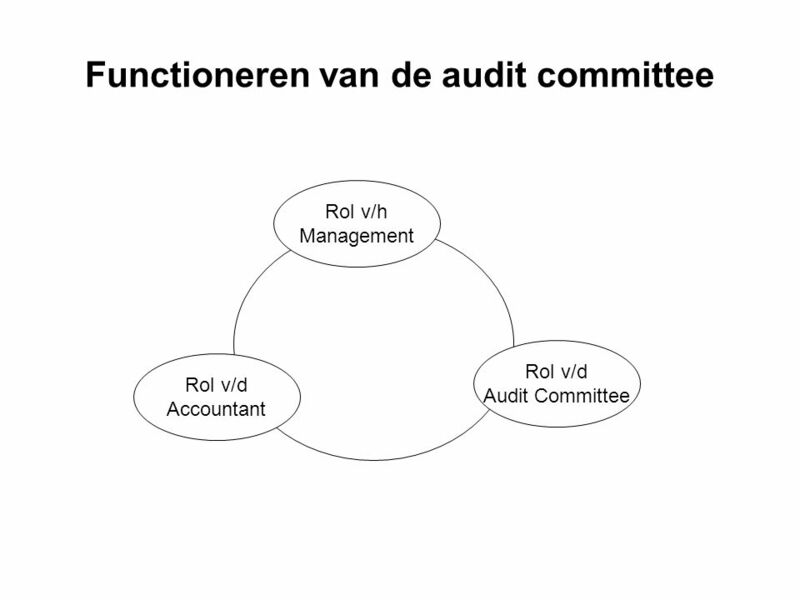 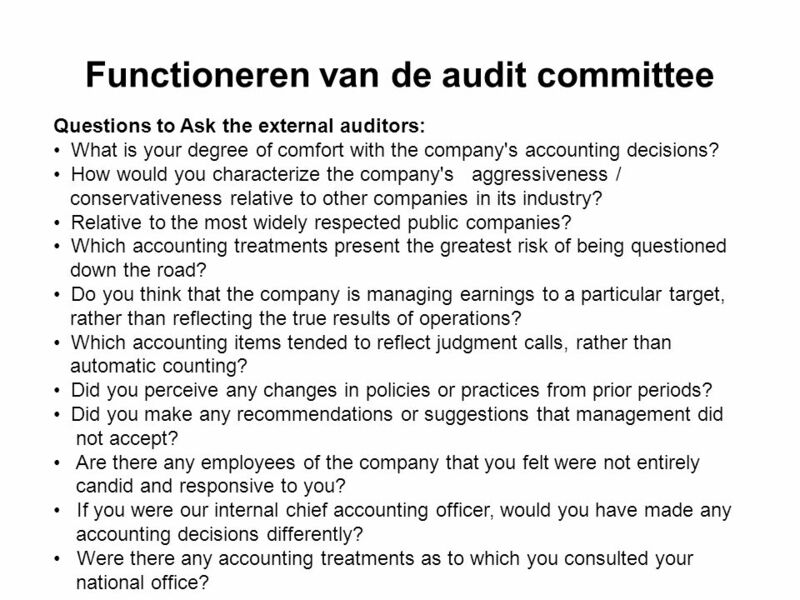 32 Functioneren van de audit committee Questions to Ask the external auditors: What is your degree of comfort with the company's accounting decisions? 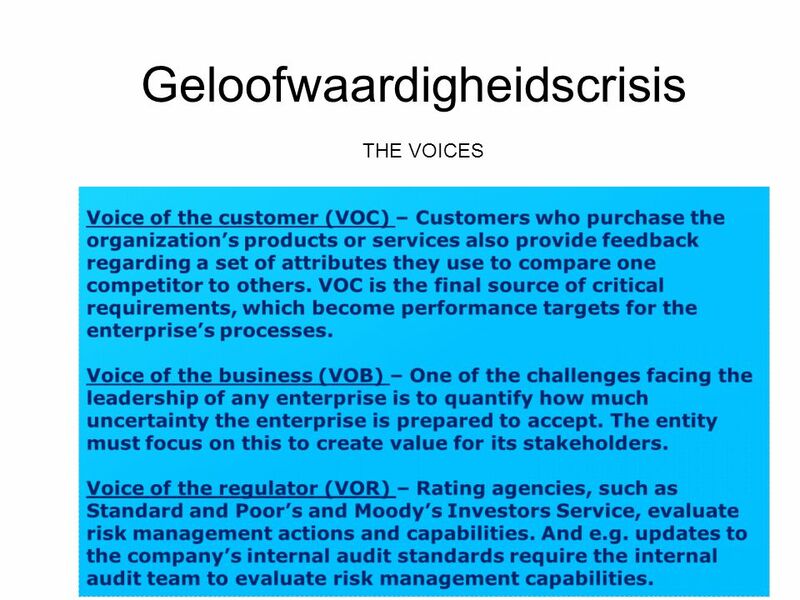 How would you characterize the company's aggressiveness / conservativeness relative to other companies in its industry? 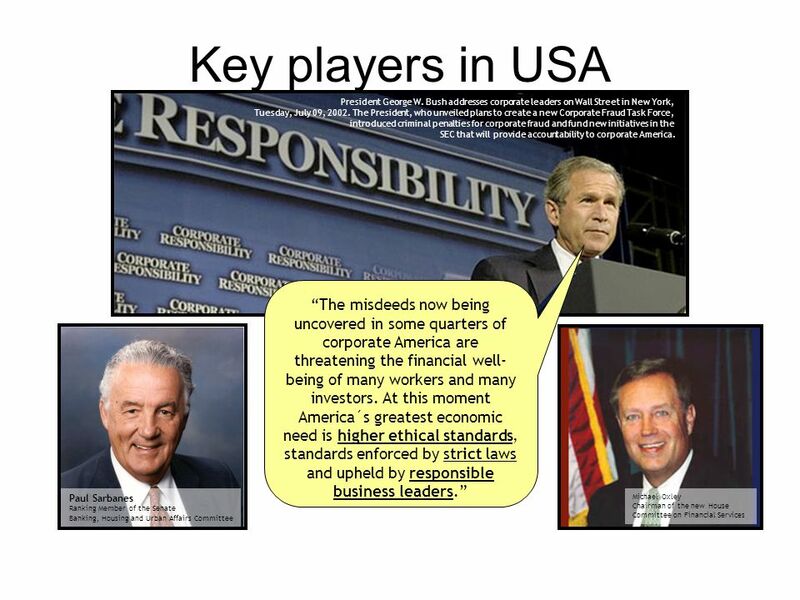 Relative to the most widely respected public companies? Which accounting treatments present the greatest risk of being questioned down the road? 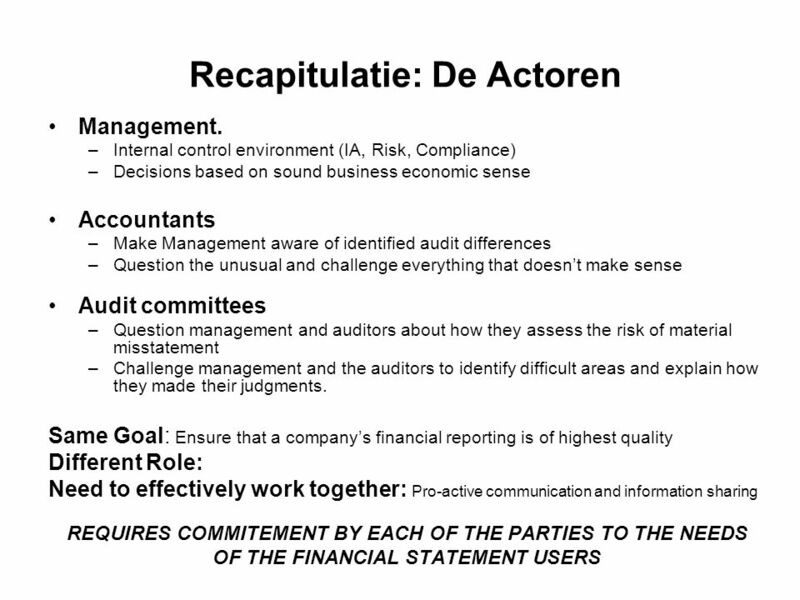 Do you think that the company is managing earnings to a particular target, rather than reflecting the true results of operations? 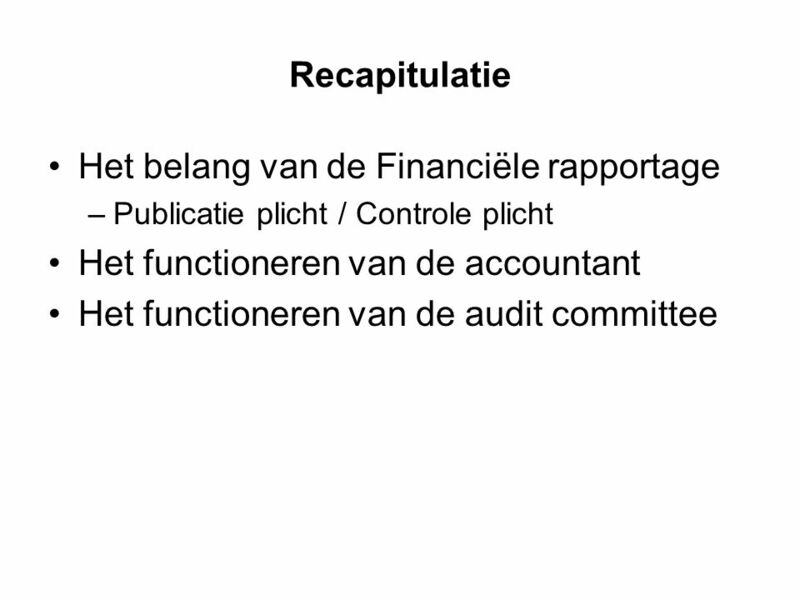 Which accounting items tended to reflect judgment calls, rather than automatic counting? Did you perceive any changes in policies or practices from prior periods? 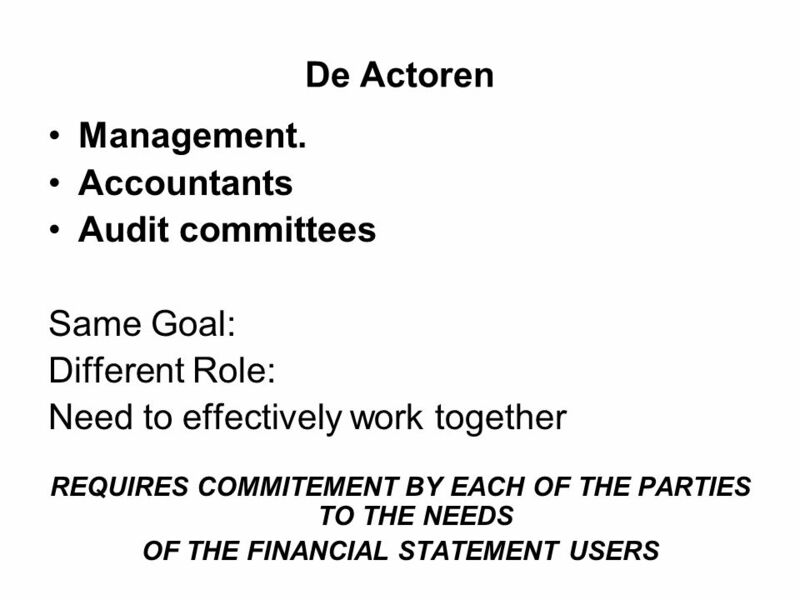 Did you make any recommendations or suggestions that management did not accept? 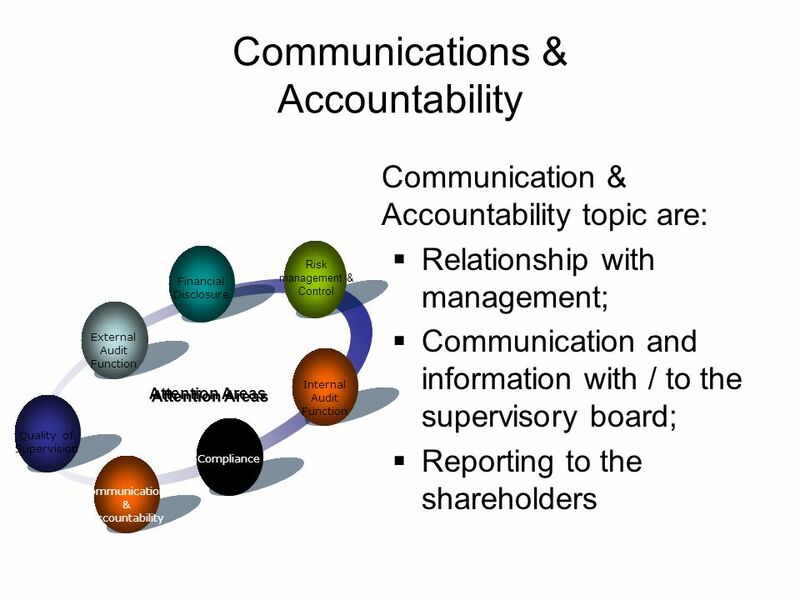 Are there any employees of the company that you felt were not entirely candid and responsive to you? 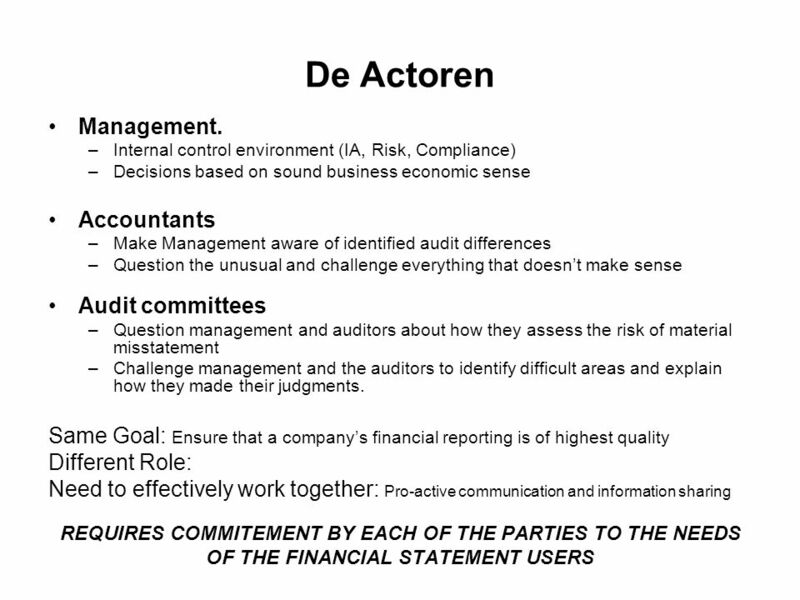 If you were our internal chief accounting officer, would you have made any accounting decisions differently? 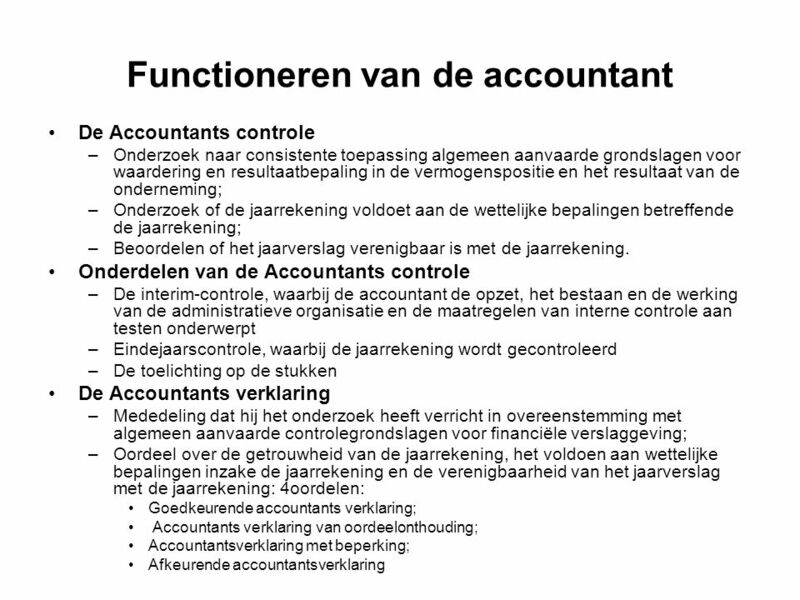 Were there any accounting treatments as to which you consulted your national office? 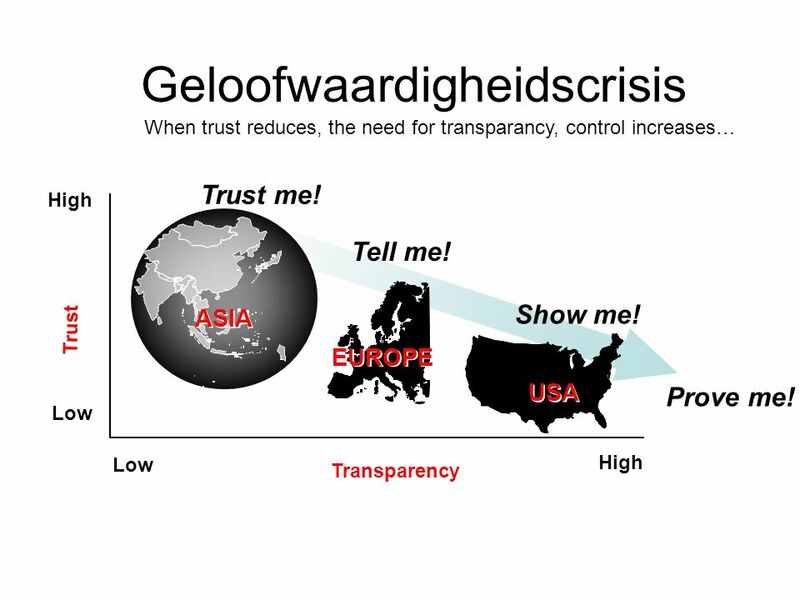 Download ppt "Cursus Good Governance Leidraad naar Commissariaat Verhouding tussen commissarissen en acountants Steven Martina 22 Augustus 2009." 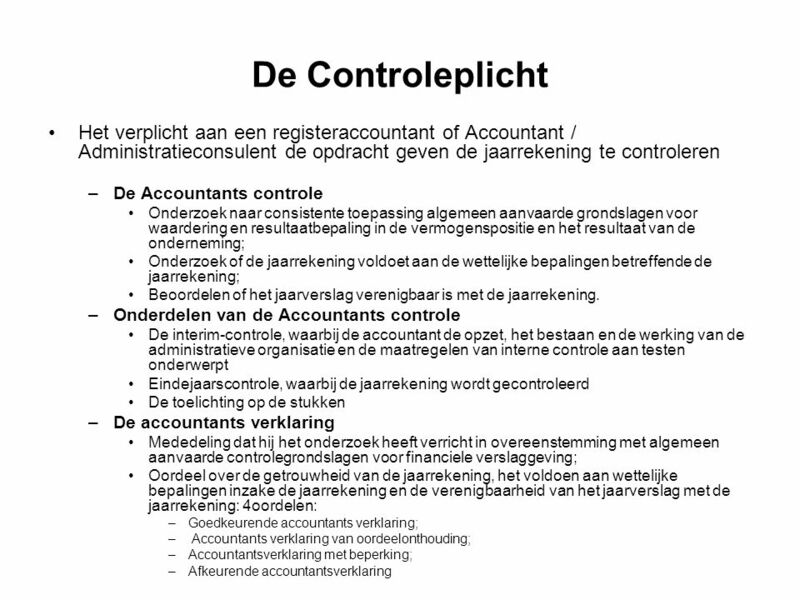 7/20/2014 | 1 › Vakgroep Belastingrecht Prof. Dr. I.J.J. 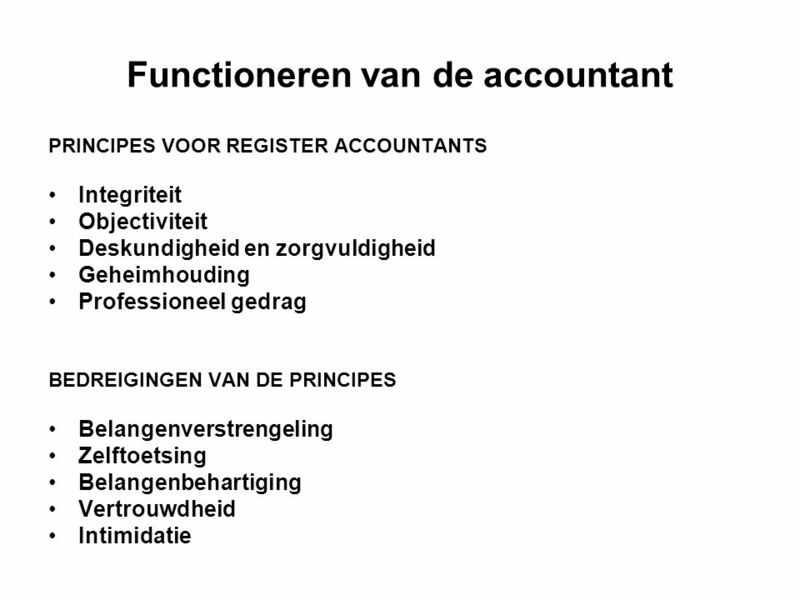 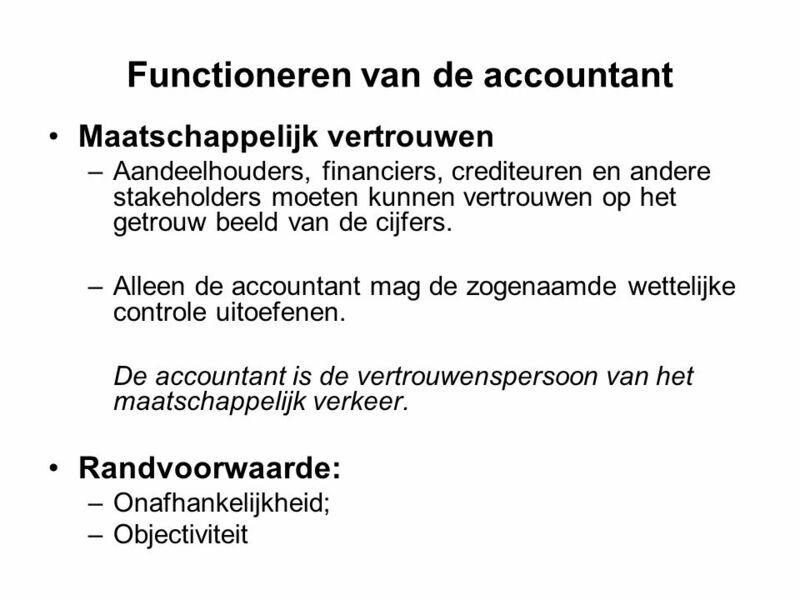 Burgers › Faculteit Rechtsgeleerdheid › Vakgroep Accounting › Faculteit Economie en Bedrijfskunde.